Cheese Paddle Knife for sale. Buy online at Zingerman's Mail Order. Gourmet Gifts. Food Gifts. As you're driving to Rory Conner's workshop near Balleydehob, Ireland, you come to an abrupt fork in the road. The sign pointing right reads, "Balleydehob 6." The sign pointing left reads, "Balleydehob 10." John Loomis, Zingerman's resident cheesemaker, asked Rory why the road went in two different directions and ended up in the same place. He said the sign had become a symbol of the Irish notion that there are always alternative routes to the same destination. I guess the same goes for cheese-cutting implements. You can choose one to simply get the job done. Or you can choose one to make cutting cheese an experience. This would be the latter. Rory makes some of the most beautiful cheese knives I've ever seen. 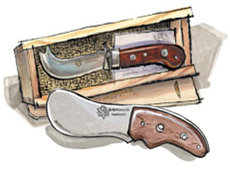 They feature richly dyed hardwood over a sturdy, gorgeous stainless steel blade. These old-fashioned tools have a heft and weight that is satisfying from the moment you hold one. Each comes in its own box and is built, in Rory's words, "like a brick #%*&house." They will become an instant heirloom. Zingerman's exclusive, very limited supplies.